The St. Louis Fed recently republished a note from last November about credit card delinquency. First, they note that millennials have the highest rate of delinquency. But then they make the obvious point that this is because millennials are younger than other generations, and young people always have higher delinquency rates than middle-aged folks. So what happens when you look at different generations when they were the same age? But what about that uptick at the end? 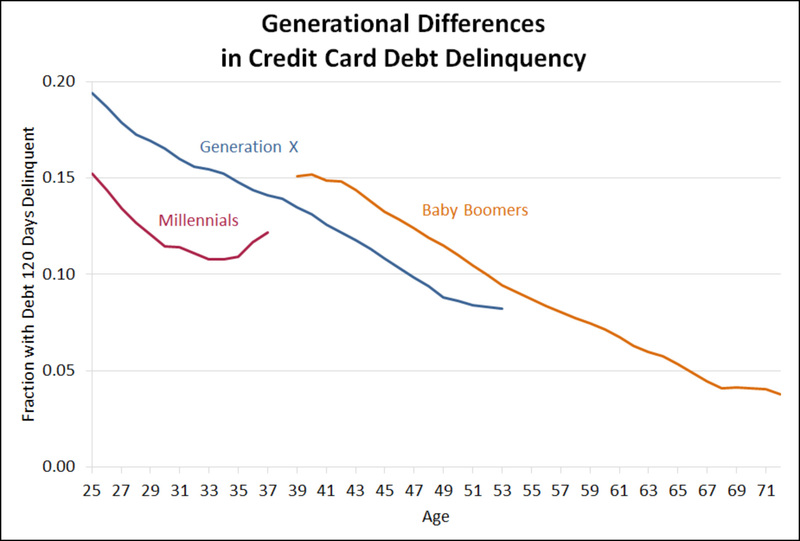 Starting around age 33, the credit card delinquency of millennials suddenly flattens and then starts to rise. That’s never happened with any other generation, or with younger millennials. What’s up with that? It’s quite prominent and doesn’t look like an artifact, but I can’t even think of a snarky guess about what might be causing this, let alone a serious guess.